Time for the first review of 2018, and it's for a game from 2017. You'll probably be seeing lots of 2017 game reviews on SuperPhillip Central as I catch up on what I missed in what was a jam-packed, A-MAZING year for video game releases. Perhaps "A-MAZING" isn't the best word to describe the first 2017 game being reviewed this year on SuperPhillip Central, but it's surprisingly not that bad, despite all the criticism towards the game. It's Sonic Forces, and it's SuperPhillip Central's first review of 2018! 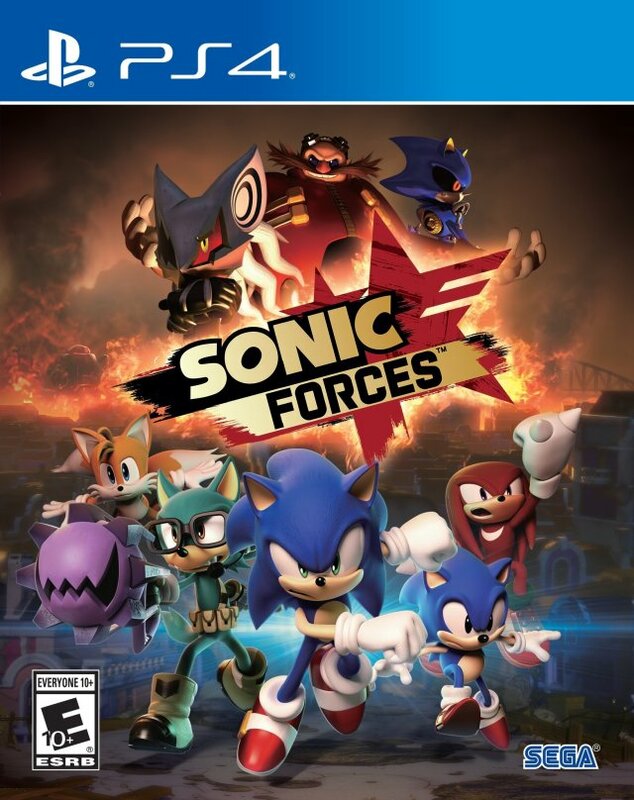 Sonic Forces is no Sonic Farce. I always take offense to people who say that "3D Sonic was never good" due to the fact that at the time, Sonic Adventure and Sonic Adventure 2 were admired games. They didn't stand the test of time, but they were early attempts at 3D platforming for Sonic Team. Even with those games notwithstanding, I argue that Sonic Colors and Sonic Generations, two more recent 3D Sonics made by the same developer, are very much quality games worthy of playing, despite anyone's aversion to the Blue Blur. On that note, after the less than delightful Sonic: Lost World and many missteps along the way, I don't really have the highest of faith in Sonic Team making a high quality 3D Sonic. Right away with the first trailer of Sonic Forces, the latest in the series, I had some serious doubts. It looked oh-so linear, it looked like it was going back to the tryhard edge that I thought was left behind after Shadow the Hedgehog stained the series once again, and the game just didn't look like it was the culmination of four years' development time. While some of the my fears weren't unfounded, Sonic Forces manages to be a good take on the 3D Sonic formula by changing things up a little. Sonic the Hedgehog's enemy, the evil Dr. Eggman, seems to try to take over the world every other week. While most of his plans are nothing to write home about and are defeated rather easily, there are the occasional doozies such as his scheme in Sonic Forces. Having the Phantom Ruby in his possession, Eggman creates a mysterious and powerful being known as Infinite. During Sonic's first confrontation with the foreboding opponent, Sonic gets captured by Eggman and put on the Death Egg. And while Sonic is away, the Eggman will play. Conquering the majority of Sonic and friends' world in Sonic's absence, Dr. Eggman seems poised to finally get his wish at beating that blasted hedgehog and his friends. That is until Sonic's friends build a coalition of -- for lack of a better term -- "freedom fighters" known as The Resistance to fight back. Recent Sonic games since Sonic Colors aimed for a more carefree approach to their stories, but here with Sonic Forces, Sonic Team returns to a somewhat edgier take with the series. I was baffled when it was revealed that Sonic was "tortured on the Death Egg for six months." Hopefully all the torture was just Eggman forcing Sonic to play his 2006 game, but the context is something else entirely in an "Oh, my goodness, they're trying to play this absurd nonsense straight." By then, I just enjoyed the ride from there, ignoring Knuckles' "that's why it's called war" declaration said in a stupendously serious tone with no hint of comedy whatsoever. Perhaps kids will enjoy this type of storytelling and take it as cool, but as for older players, it's just hilarious to see the direction the Sonic series has returned to storytelling-wise. And just like that, Sonic the Hedgehog is off to save the world once again, but this time not alone! For the first time in Sonic series history, players can create and customize their own Avatar to play as. Starting off, you begin by selecting an animal species such as a bird, wolf, dog, hedgehog, etc. Which ever species you pick has several customization options like being able to choose from a set of ears, eyes, fur or feather color, voice, victory pose, and more. You can customize and edit your Avatar at any time, though you can't change certain aspects of your created hero such as its species. No worries, however, as once Sonic Forces has been beaten, you can create multiple Avatars instead of just being confined to the one. The real enjoyable aspect of customizing your hero comes from completing in-game tasks and beating levels. Completing these unlock a handful of new attire options for each objective satisfied. You can gussy up your Avatar in a full outfit, from headgear, to pants, gloves, body suits, jackets, shirts, footwear, and so on and so forth. There are over 500 unique pieces of fashion to outfit your character with, and this will no doubt make certain players very happy, whether through their love of character creation or merely collecting as much stuff as possible. Sonic and his new buddy show Dr. Eggman the true power of teamwork. And Sonic Forces has a bunch to collect despite the game being on the short side, about 4-5 hours to complete. The 30 stages go by fast, taking 2-5 minutes each, but these short bursts of action are preferable to the cluttered, overly long messes that players had to endure in the less satisfying 3D Sonic games like Sonic the Hedgehog (2006), Sonic Unleashed's nighttime segments, or Shadow the Hedgehog. The smaller focus on shorter stages allows there to be enjoyed and replayed for better times on the online leaderboards and for aiming for those sometimes challenging "S" ranks. It's a good thing that Sonic Forces' stages are so short. Replays aren't as daunting of a task as they were in other 3D Sonic games. This returns to my previously brought up thought about a lot to collect. 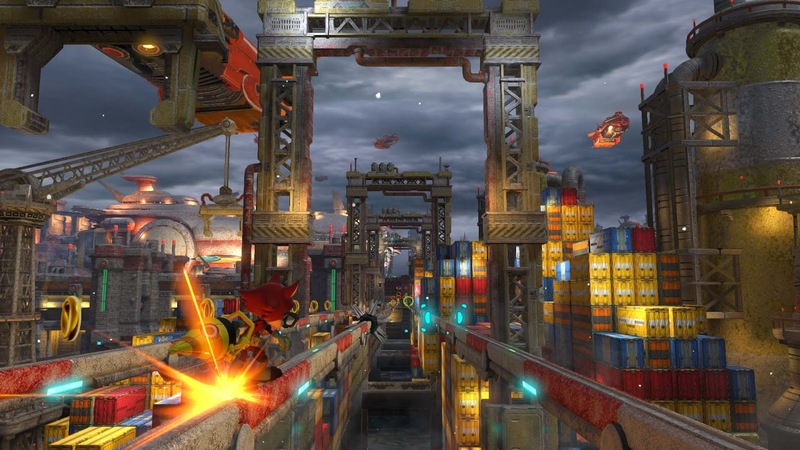 Though optional to do, Sonic Forces' 4-6 hour campaign can be extended greatly through the collection of the game's Red Rings, five of which are found in each traditional stage in the game. Collecting all five in a stage then unlocks Number Rings to collect in that same stage. One final series of collectibles, Silver Moon Rings, unlock afterwards. Both Number and Silver Moon Rings need to be collected in a certain order, with the latter needing to be gathered in a limited amount of time. Not only is collecting all the Ring types for achievements and trophies, but they unlock additional, quick but challenging obstacle course levels and new outfit pieces. 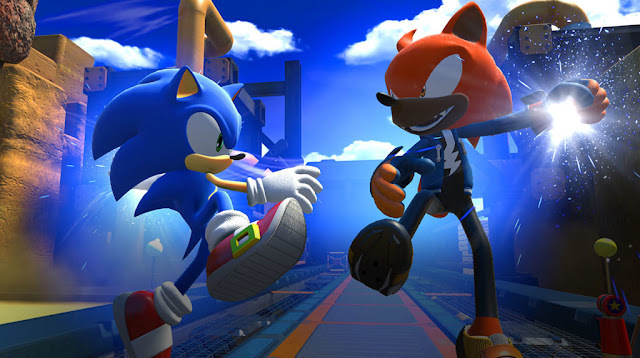 The 30 stages in Sonic Forces are split up between four gameplay types: playing as Modern Sonic, playing as Classic Sonic, playing as your Avatar, and teaming your Avatar up with Modern Sonic for tag team levels. 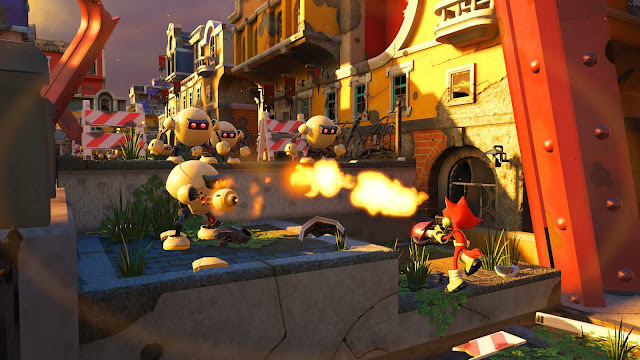 These joint operations have the fewest appearances in Sonic Forces with just three implementations. 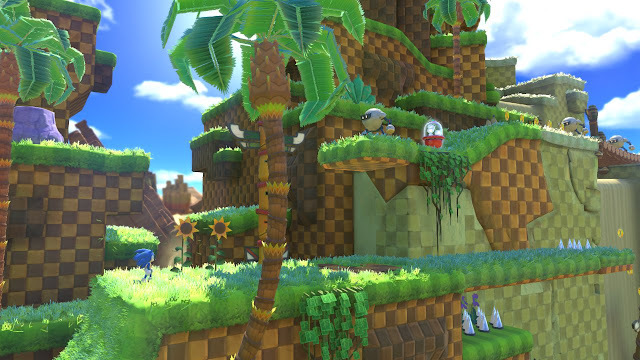 Meanwhile, Modern Sonic features a mix of 2D and 3D, but unlike past 3D Sonic games, the 3D areas are much more restricted in where you can move and go. Heck, the first level of the game, set in a sandy version of Green Hill, basically constricts you on a path when you're viewing Sonic from behind the back. The camera cannot be turned, and trying to move backward in this form is a recipe for death. It can be a little jarring switching from a 3D section to a 2D one some of the time control-wise. Meanwhile, Classic Sonic, who this time comes from the much loved Sonic Mania (released earlier last year than Forces) to pretty much do nothing other than have the developers say he's in the game, has levels that are all played out in 2D. 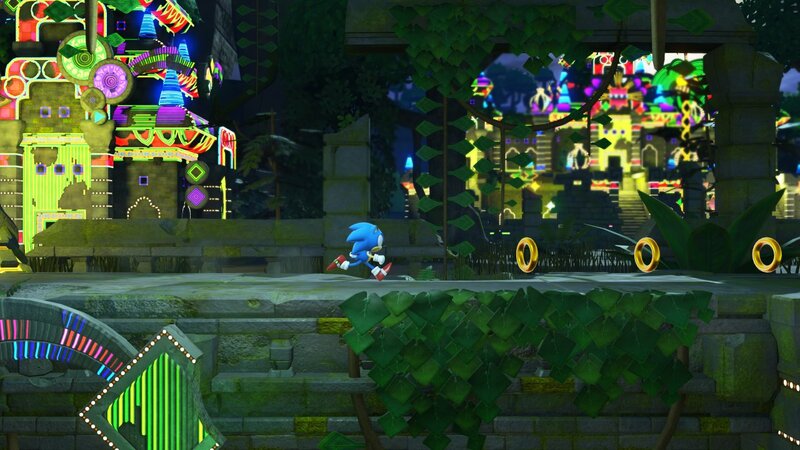 Even his drop dash is included from Sonic Mania making for some new speed-running tactics for Classic Sonic in a 3D-based Sonic game. Despite the physics for both Sonics being less commendable to the devs than an official game created by fans -- this is due to things like poor midair momentum, off physics, and sometimes gnarly collision detection and bugs -- the stages in both hedgehogs' adventure play out overall well. Many have multiple paths to them, especially the 2D-only levels, which brought fleeting memories of the classic Genesis Sonic games of old and yes, Sonic Mania, as well. Casino Forest has Classic Sonic striking it rich among the trees and local fauna. Finally, playing as the Avatar is full of cheesy goodness, and most of the cheese comes from Knuckles and the rest of the Resistance's copious supply of praise for your character, almost spreading it on too thick to annoying amounts. "No, Knuckles, I don't know how you'd make it without my Avatar either." Yes, Sonic Forces is a game where players can live their furry power fantasy while Sonic the Hedgehog calls you "buddy." Finally, acceptance for being weird! The Avatar levels are a mix of 2D and 3D like Modern Sonic, but your character has more in its arsenal, such as elemental-themed weapons called Wispons (named after the Wisps which debuted in the Nintendo Wii's brilliant Sonic Colors). These Wispons have various effects in the form of buffs and bonus abilities like gaining more points by collecting chains of rings, but the real benefit comes from the types of attacks each Wispon does. One can let out a burst of flames to seer foes to destruction while also causing an explosive boost that causes your Avatar to soar in the air (at least when you find a Red Wisp item capsule). Another example is a Wispon that unleashes an electric weapon to shock enemies into submission. The alternate ability granted by collecting a Yellow Wisp allows your Avatar to perform a light dash a la Sonic Adventure 2 where the character speeds along a path of rings, no matter if it's along the ground or floating in the air. Using different Wispons and their Wisp abilities grants access to parts of stages that would otherwise be inaccessible to Avatars with Wispons of a different type. It's lucky for the Avatar that these Dr. Eggman-designed robots aren't fireproof. The other notable feature of the Avatar levels is a grappling device that hooks onto specific circular, midair objects. It safely pulls your hero across wide gaps, dangerous chasms, and allows reach to otherwise impossible-to-reach areas. While it's cool to look at, the need to use a lock-on function to attach yourself to the grappling point (Modern Sonic homing attack-style) means sometimes you'll be in range of the device and occasionally press the grapple button to no effect, falling down into a pit because the game decided you were no longer in range. These moments are maddening, but thanks to a 3D Sonic game finally ditching a lives counter and the aforementioned short length of stages, it doesn't take long to get back to where you were. Ample checkpoints also make this less frustrating as well. Sonic Forces performs satisfactory on all platforms it is on. The only real loser here is the Nintendo Switch port that suffers from less detailed environments and some occasional slowdown. Meanwhile, the version I played, the PlayStation 4 build, offered much more in the way of detail, but it still didn't seem like a 3D Sonic game for 2017. When Sonic Unleashed, a game from 2008, looks more impressive than a 2017 Sonic game, I either have to blame the art direction or stay perplexed. Sometimes it's difficult to distinguish between your character in relation to what's going on, or even seeing an enemy ahead. This isn't even while boosting through levels, but instead when doing slow, methodical platforming. The Avatar has just as many stages as Modern Sonic to play through, 8 in total. Tomoya Ohtani and company went a different direction with the soundtrack of Sonic Forces, opting for a dubstep, electronic sound. There are still the occasional orchestral tracks, but most tracks are the former. At first, I didn't like hearing what was passing through my ears, especially when watching gameplay footage, but after playing Sonic Forces in length, the music actually works. Whether it's Modern Sonic's more rock-centric stage themes, Classic Sonic's synth-filled takes on Genesis music, or the Avatar's vocal and electronic stage songs, the soundtrack does indeed work. 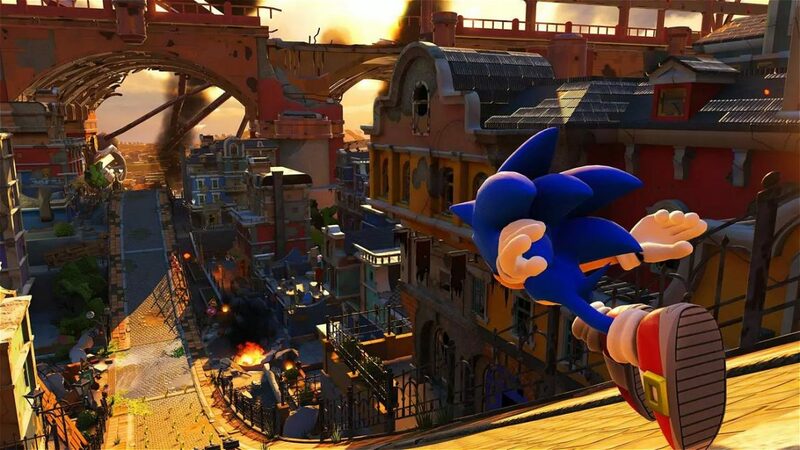 Pertaining to sound, Sonic Forces features solid work by the voice cast, offering nice and safe performances both during cutscenes and in stages, but for stages, you can always cut off radio chatter if that gets to you at any time. It turns out Sonic Forces isn't a stinker after all. In fact, on many occasions it can be a lot of fun. Well, that is if you can ignore the uncommon bugs, the not-quite-there physics, the hilariously awkward and awful story, and then some. The lack of lives as well as having shorter stages and mostly enjoyable level design made for 3D Sonic game that I did, all in all, like. Kids will really dig this game, while older Sonic fans might also enjoy it, too. It's probably safe to say, though, that those who haven't been won over by a 3D Sonic game yet won't be won over by this one. Not even if you "forced" them to.